Kai Winding featuring Kenny Burrell - !!!More!!! Egad! There were no limits of shame, no territory too sacred for the Creed Taylor organization to transgress. 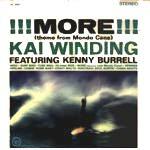 Kai Winding and Kenny Burrell teamed up on many a studio project, including this surf-jazz extract. CTI is the label that brought you an endless string of high gloss soft jazz albums, and occasionally something as cool as Deodado's "2001: A Space Ondoline," which appeared in the great film "Being There." The CTI orchestra here is Kai Winding - trombone / ondoline (the wailing theramin-like sound), Kenny Burrell - guitar, Paul Griffin - electric piano, plus three more unidentified horn players, a bassist, and several other guitarists. Very bizarre. Funny title. This reverby twango stomp pumps cowboy cool, surf rage, and barnyard fun. Really a nice track. Not melodic, just high energy playfulness. Ringing guitars and a cattle drive on a desert crossing. Intriguing arrangement, and fine imagery. A very nice track. Howling dark guitar thunder, cowpoke Hava Nagila sensibilities, and infectious rhythms. Chunky punchy and energetic. This has a huge sound. It's big, dramatic, and riveting. From the opening organ, through the thumpy bass and drums, and into the spy melody line, this is a thick and eerie track. Melodic and almost psychedelic. The swirling liquid lights and strobes seem inherent, but that doesn't mean it's really a psych song. It just has that kind of performance hall feel to it. Infectious and hauntingly interesting. A slightly western feel here, with a modern rock tone and melody line. Enough twang to fit into a spaghetti western set. A mean sounding guitar, with whistling organ accompaniment. The tribal drums and rhythms are great. It slows down in the middle for a twangy ride, but soon returns to a very cool spy ethic sound. This is a very nice track. The chanted opening lines are panned "agent" right and "orange" left. Britishizing the TV theme, with big guitar tones, and ample chunk. The organ adds an element of distinction between this version and a thousand others. Twango for weightlifters, surf for knuckledraggers, instros for the musclebound. You can thin of all the stereotypes you like, but only the title can be pushed into those corners. The track is chunky, powerful, and quite fun. It has fuzz, big edge, drama, and military oomph. Expecting an instrumentalized version of the Roky Erickson tune, I was surprised with something much more chunky and thick. Not very melodic, but with it's funky progression, it walks you right into that dark alley you were taught to avoid as a child. What a nice track. The organ and guitar tones are complimentary, and the melody is playful without being silly. It's infectious, and smooth. Spooky dub stylee military chants open the track. Link Wray's most recorded tune gets the UK monster treatment. It's huge and moody, but lacking in intensity. The variations in the second guitar work and organ chill provide a shift away from the just-another-cover label.